I’ve heard great things about this Chicago Beer, especially from my friend Lee Williams. So as soon I saw fellow beer blogger, Jake Koeneman, tweet about going to the brewery to pick some up, I jokingly tweeted back “Pick me up a Couple”. Well he did and now I’m about to indulge in a 22oz bottle of Double Daisy Cutter. It’s rare these days that I actually get to try new beers that are not local. I’ve been drinking a lot of beers from my cellar and have not done much trading recently. So now I need to thank my Buddy Jake for this beer, because it is exactly the type of Pale Ale I love, in fact it is very similar to the Pale Ale’s I brew. I’m a big fan of of malty, aromatic and muted bitterness in my Pale Ale’s. basically a hoppy English Pale Ale is what I like. This beer with it’s tropical bubblegum aroma, big creamy malty flavor is right up my alley. I forgot the best/worst part of this beer, my wife loved it too! Why is that bad, well I can’t get any more easily, but good because it is another beer that my wife likes. Score! Score! Score, all the way around. Glad you enjoyed it buddy. I’m a bit spoiled having them within 5 miles of my house because they churn out some awesome stuff. The brewery is two blocks from my house and yes I’m very happy. Daisy Cutter and BBQ Ribs are a match made in heaven. Luck You! 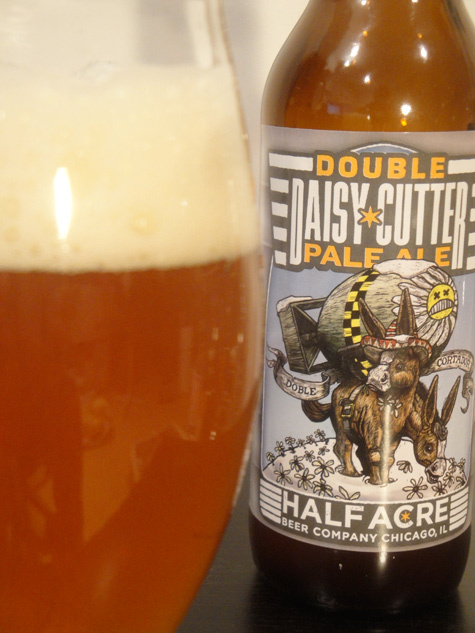 I’m a huge fan of the Daisy Cutter and Double Daisy Cutter!